Have you driven a 1987 Jeep Wrangler? Displaying 1 - 10 of 15 1987 Jeep Wrangler reviews. Its Awesome — I have had the car for a while now. It is old, and I have never taken the time to get it completely fixed. But it drives and its a jeep and it is super fun. The engine leaks oil, but the 4.2L In-line 6 will never die. Good Solid Second Vehicle And Now Dedicated Off-road Vehicle. — 1987 Wrangler, NP231, Peugeot 5spd, 258ci, originally had Carter 2bbl. Over 200K miles. Installed Mopar Performance Fuel Injection late 90's. Best money I have spent so far. Increased mileage,drivability,easier starting and great performance off camber as well as inclines. Now 5" spring lift,1" body lift, 35" BFG MT's,SYE,4.56 gears,ARB locker up front and Detroit Locker in the rear. Alloy 30 spline axle shafts front and rear. Used now for trail riding mostly in East Tennessee. Pros: Great for it's purpose. Bought it new with hard top and AC. Worked good in Florida's heat and humidity. Pros: FUN!, reliable,agile, will go anywhere. not a family vehicle, they can fit, but not great for long drives. Pros: It's a Jeep, need i say more??? Yj Islander — Performance is moderate but no extraordinary. Brakes work well, but require monthly maintnance. Handles the way I like, it does have some road feedback in the steering, but not a lot. I find it hard to bottom out off road. It's yellow, black and chrome in and out. 32" 11.50 mud trac's, which humm louder than the motor, but the bite everything. Not winter tires. 4.2L fuek injected straight 6cyl, is average on gas, windy days 300km per 40 dollar fill up, or 600 km stop and go city driving. on a full tank. if you like to feel the road fight back off road it's a 10 for fun factor. Had One, And Going To Get Another One — Ok try imagining yourself on a raging bull, going 100 km h and kicking at you not to get you off but to get you to do some off-roading, so easy to modify but stay away from the electronic carburated model it's a bunch of trouble. Wow. Totally unexpected. That's what I thought when my cousin said that he was going to Switzerland with his family and asked whether or not I would look after his wife's 1987 Jeep. Of course, I said, who would pass up the opportunity for a free car? The car arrived before I was finished with my 2-week stint at the University of Notre Dame's Intro to Engineering program, but needless to say when I got back I immediately went out for my first drive in the Jeep. Nothing can explain the first time you pilot a convertible, especially a Jeep. I've driven tons of convertibles at Enterprise since then, but I can't get past the feeling of driving a Wrangler - it's truly a unique experience. Modern NVH engineering must go out the window to appreciate this car. There was only one top - the soft top. It rattled, flapped about, and took eons to put up and take down. But it was the CHARACTER that kept the smile on my face day in and day out, plus you get a badass feeling when you leave the windows off during a rain storm. You're only young once. The Jeep came with all the right options - leather wheel (rare in a non-Laredo Wrangler), factory A/C (although it didn't work but I didn't mind), wide-tired steelies (which I painted) with an aluminum spare, and the 4.2L straight-six with the 5-speed manual transmission. Fuel economy was, um, predictably bad, especially since the six came with a computer-controlled carburetor (while the 4-cylinder model came with fuel injection, interestingly). The best I got was 15 mpg in the summer, and about 11-12 mpg in the winter - mostly suburban driving. The driving experience was unique, again filled with a lot of character. The steering wheel wasn't on quite straight, but the handling was predictable, and as long as you didn't try anything stupid, the Jeep was surprisingly nimble. Foul-weather handling is this Jeep's forte, and has few competitors in that realm - I rarely had to use 4WD even on the worst of snowy roads. 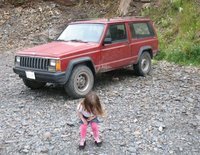 The best thing is that Low Range coupled with first gear produced a great "Jeep Crawl" that could allow me to navigate down my steep driveway without having to apply the brakes - pretty cool. I drove this car all throughout my senior year, and even though my cousin's wife offered to give me the car, at $2k/year in insurance, coupled with the addition of a brand-new 2005 Mini Cooper S to the family stable (which bumped my mom's 1998 A4 down to me) forced me to give up my high school ride. It's a shame I never got to turn a wrench on it (it was EXTREMELY reliable) or modify it, but it has moved on to serve another person's needs, just as it had served mine. CarGurus has 21,028 nationwide Wrangler listings starting at $2,499.